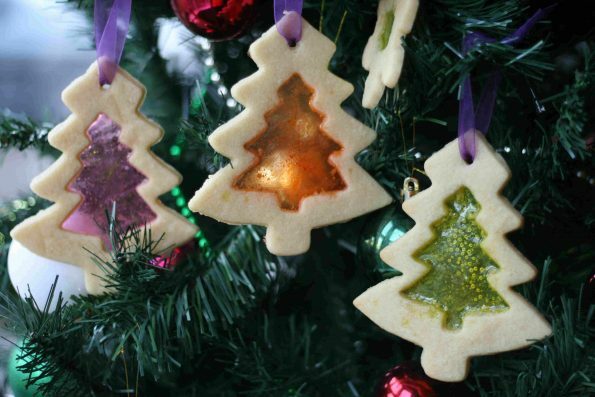 I meant to make these stained glass window biscuits last year, but never got round to it, so I wanted to make sure we did it this year. 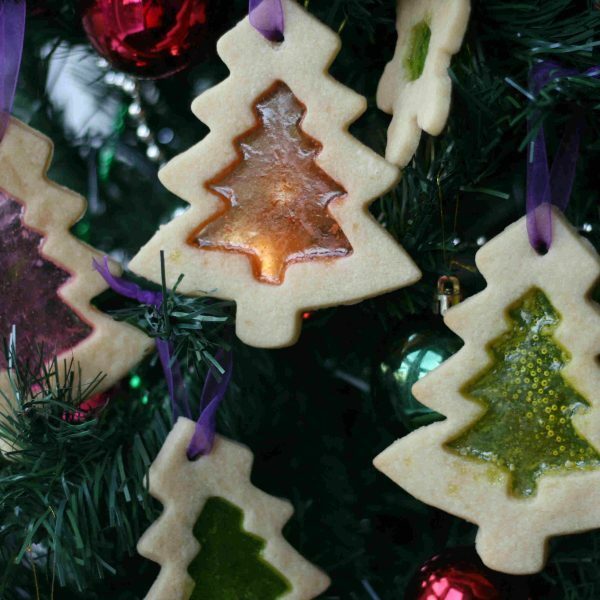 To make it easier we did them at the same time as our other Christmas cookies so we could use the same dough. 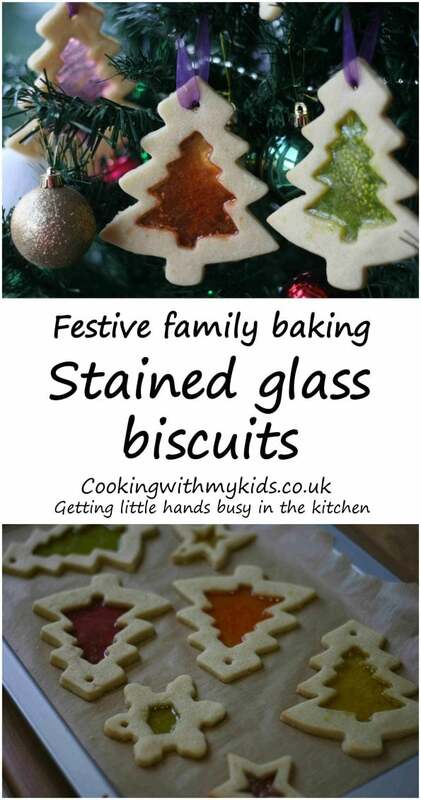 If your kids like bashing things then these biscuits will be right up their street. Hannah had a great time choosing the different coloured sweets and crushing them with the rolling pin. It’s not something we do every day in the kitchen so it was a lot of fun! 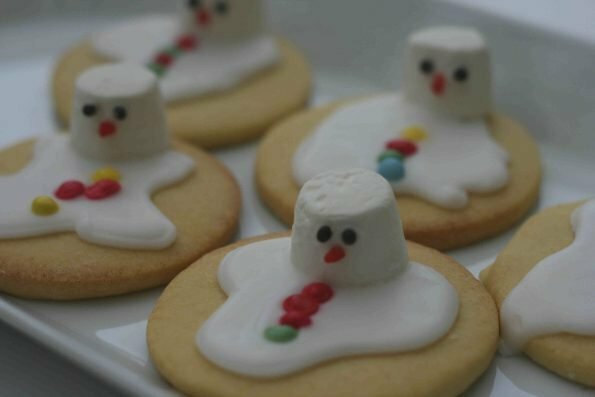 I was a little surprised at how well they turned out, as I wasn’t sure whether we’d get the timing right with melting the sweets but making sure the biscuits didn’t burn. They worked a treat though, and look great hanging on our Christmas tree! Preheat the oven to 170C/160C Fan /325F and line several baking trays with baking paper. 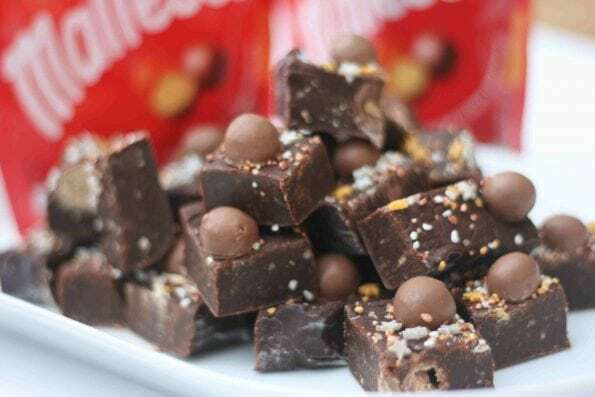 Get your kids to help measure out the butter (200g), sugar (280g) and vanilla extract (1/4 tsp) and pop them in a large mixing bowl or freestanding mixer. 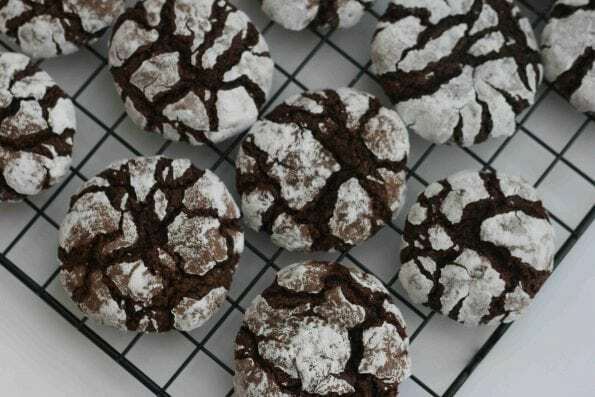 Cream them together until the mixture is light and fluffy. Crack the egg in a small bowl and add to your mixture. Mix everything together. If you need to, use a spatula to scrape unmixed ingredients from the side of the bowl. 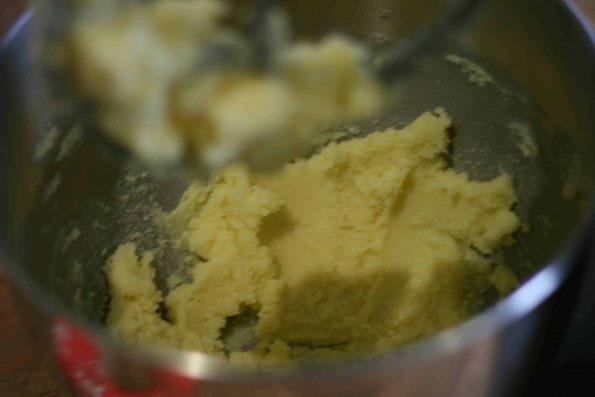 Measure the flour (400g), salt, cream of tartar (1/2 tsp) and add to the butter/sugar mixture. Mix everything together so it comes together into a ball of soft dough. 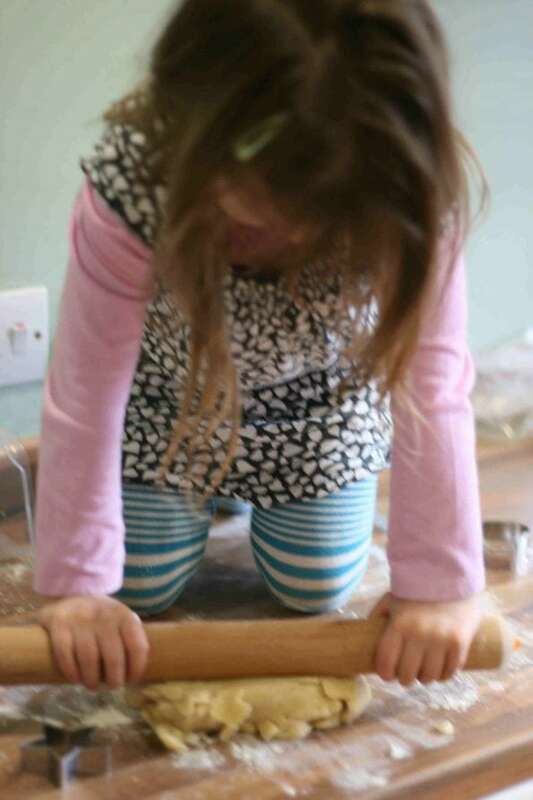 Dust your work surface with a little flour and roll out your dough until it is about ½ a cm thick. 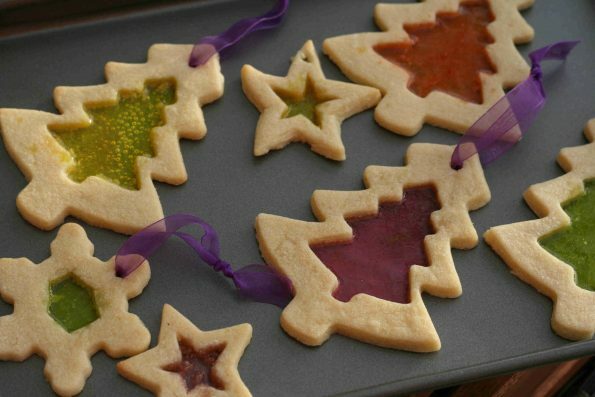 Use festive cutters to cut shapes out and place them on your baking trays. 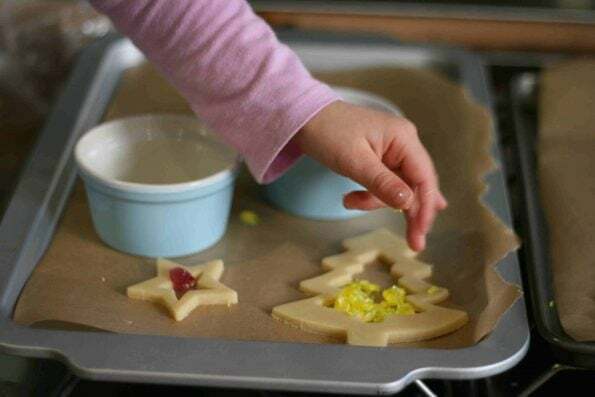 If you have two cutters of the same shape but in different sizes, these work well for making your window. 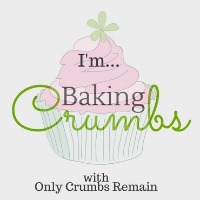 If you don’t, just use a knife to cut a hole in the middle of your biscuit. 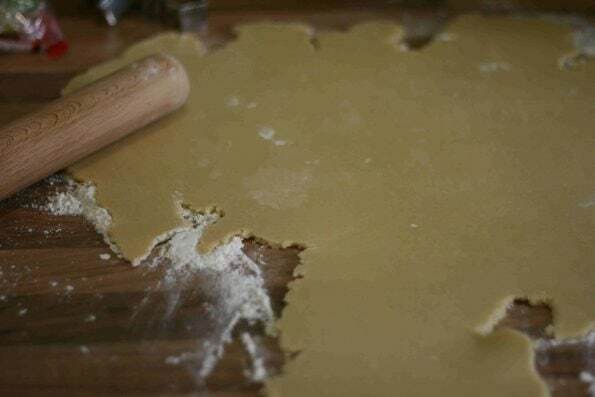 Crush the boiled sweets (while still in the wrapper) with the end of a rolling pin. Hannah enjoyed this a lot once she got the hang of it. If your kids are littler they might need some help as you need to give them a good whack! 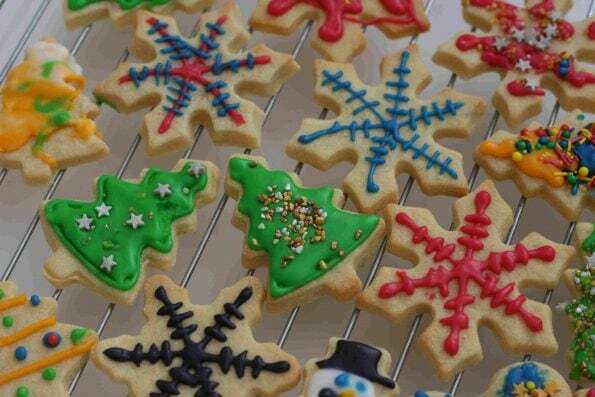 Sprinkle some of the crushed sweets into the middle of your biscuits. 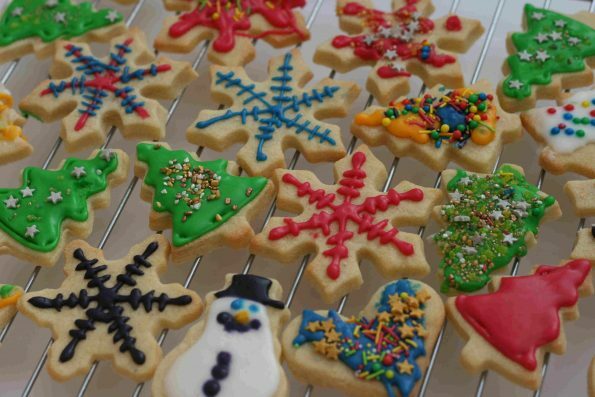 Pop the cookies in the oven for around 10 minutes. 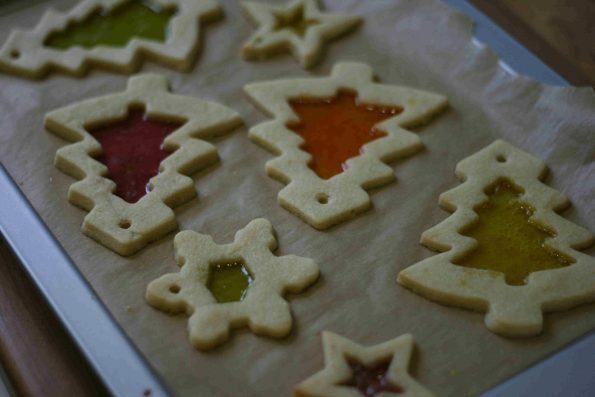 They’re ready when the edges are starting to turn a little golden and the window sweets have melted. 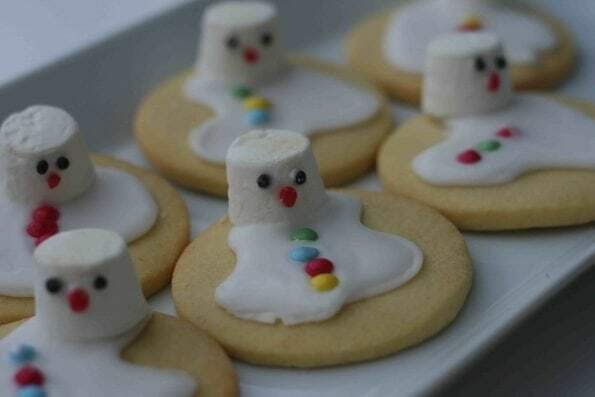 As soon as you remove them from the oven use a straw or something similar to poke a hole at the top of each biscuit if you want to hang them up. 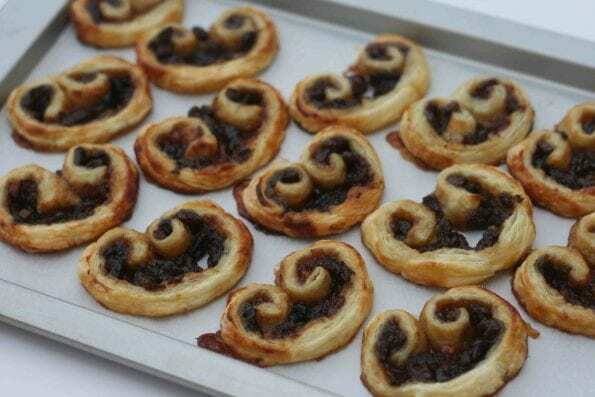 Leave them to cool until the windows have hardened. 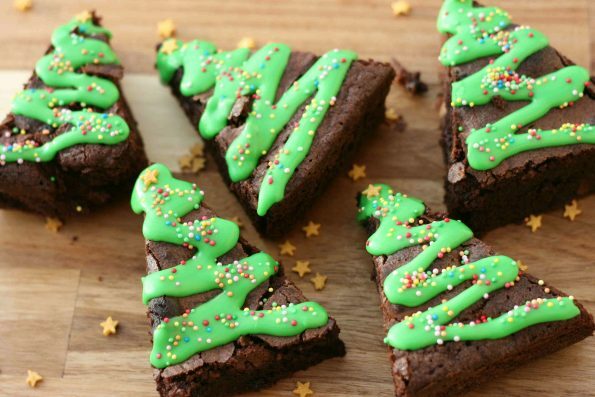 Place them on a wire rack to cool completely. If you’re planning to hand them up, thread a ribbon or thread through the hole. 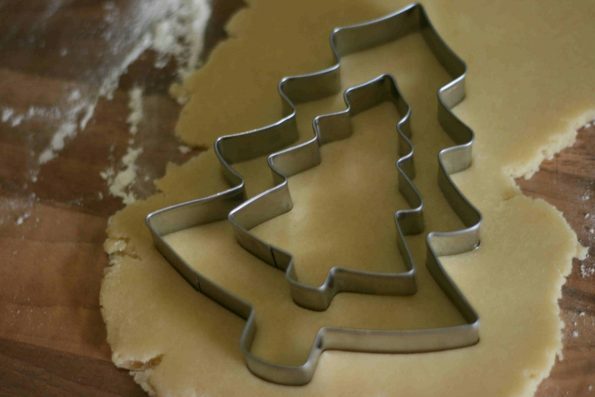 Measure out the butter, sugar and vanilla extract and pop them in a large mixing bowl or freestanding mixer. Cream them together until the mixture is light and fluffy. Measure the flour, salt, cream of tartar and add to the butter/sugar mixture. 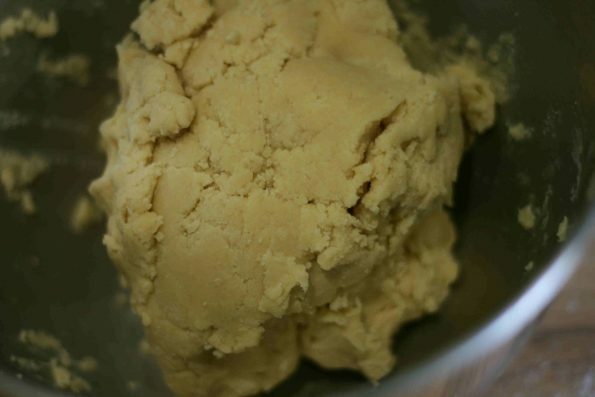 Mix everything together so it comes together into a ball of soft dough. 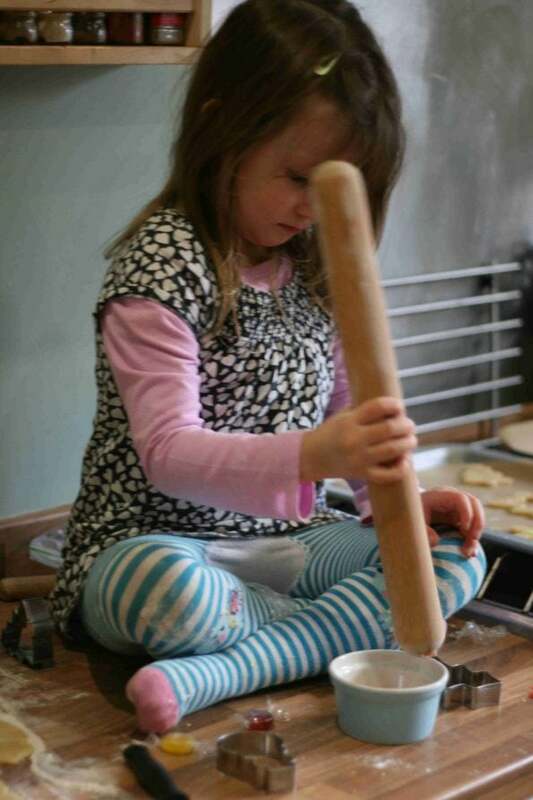 Crush the boiled sweets (while still in the wrapper) with the end of a rolling pin. 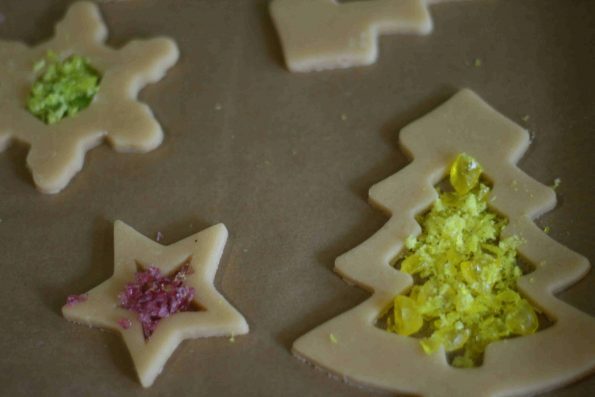 Sprinkle some of the crushed sweets into the middle of your biscuits. Yes, just one layer. We cut a hole in the middle and the sweets melt and fill it in.